After working through various design concepts, we landed on this spunky layout. 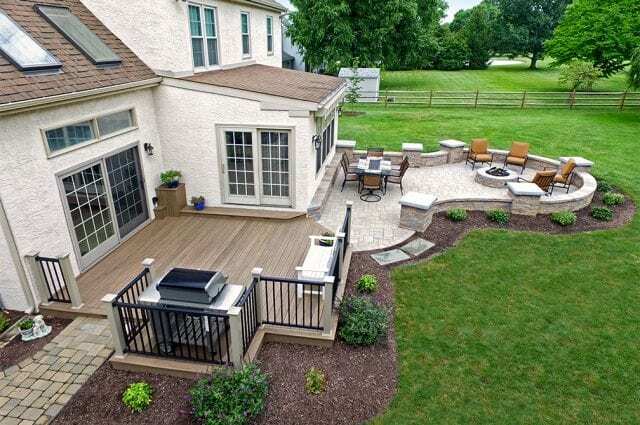 A great combination of decking & hardscaping. Fitting the customer’s needs for a simple space without a lot of fluff, or excess space they wouldn’t use. With subtle touches throughout the job; a bump-out for the grill, a flower box to add character to the step, & even continuing the seating wall along the house wall – to hide a less appealing wall, where an old deck once attached to the foundation. Altogether, it’s the little things that help to create a one of a kind custom space for years of enjoying!